The oldest Cider Brandy the distillery makes is this superb 20 Year Old and is limited to one barrel bottled every year. It comes from two copper stills (called Josephine and Fifi) before it is matured in small oak barrels. The brandy has taken on colour from the oak, becoming richer, smoother and more characterful. 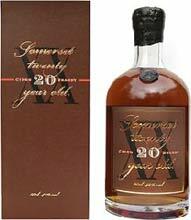 This extraordinary little 20 year old is mellow and warming; it has a slight nuttiness, leather, some dried fruits, is powerfully floral and yet still retains the fresh apple character it was born with.